Remember, Valentine's Day is February 14! New partnership form will be easy to miss. Tax election available to deduct some 2010 Haiti relief. California businesses are required to file use tax returns. New business books to read. Can you claim a tax deduction for gifts to a friend? PS Enjoy Dining at MarchÃ© Aux Fleurs. Subscribe/Unsubscribe from Michael Gray, CPA's Tax & Business Insight. 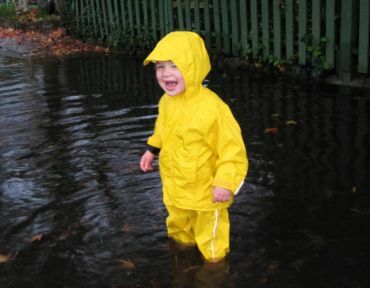 Clive Baker thinks rain puddles are cool. Remember Valentine's Day is February 14! My daughter and her husband, Holly and Dan Baker, tell me their restaurant, MarchÃ© aux Fleurs, is fully booked for Valentine's Day. Hope you've made your reservation for your favorite restaurant. Janet and I will be babysitting two of our favorite "Valentines," our grandsons Panch and Clive Baker, while their parents are working at their restaurant. My grandson, Clive Baker, will celebrate his second birthday on February 23. Thi Nguyen, our resident CPA, will celebrate her 31sh birthday on February 24. Home loan interest rates are still low. The refinance loans that we offer are mostly on a no-points, no-fees basis. This gives the homeowner more flexibility for refinancing again in a short time. For example, one of our clients closed a mortgage with a 5.375% interest rate on September 26, 2009. Recently, the client locked a 4.875% interest rate for refinancing the same loan, for a half percent rate reduction with no points and no fees. It doesn't happen often, but it's possible. For many homeowners, there is a refinancing opportunity now. We provide home loan brokerage services through our strategic partner, Wymac Capital, Inc. To explore whether we can help get financing for your new home, reduce the interest rate on your mortgage, or convert an adjustable rate mortgage to a fixed-rate mortgage, call Michael Gray at 408-918-3161. New partnership form will be easy to miss or make errors in reporting. The IRS has issued new partnership form 1065, Schedule B-1, Information on Partners Owning 50% or More of the Partnership. This form hasn't been required in the past. Since ownership includes attribution from certain family members and trusts, several partners in a family partnership could show ownership interests up to 100%. (The attribution rules are complex and beyond the scope of this alert. Get professional advice.) It will look weird because the percentages might add up to more than 100%. Heads up! Tax election available to deduct some 2010 Haiti relief donations in 2009. President Obama has approved Public Law 111-126, H.R. 4462, allowing taxpayers to choose to deduct certain donations made during 2010 for relief to Haiti relating to the earthquake on January 12, 2010 on their 2009 federal income tax returns. California has not conformed to this law! In order to qualify, the donation must be of cash to a U.S. charity specifically for Haiti relief. The American Red Cross web site where you can make a donation is www.redcross.org. The donation must be made after January 11, 2010 and before March 1, 2010 in order to qualify for the election. In addition to the usual way of documenting donations with a cancelled check and qualified receipt, individuals who make donations using their cell phones can document their donations using ther telephone bill. The bill must show the name of the charitable organization, the date of the contribution and the amount of the contribution. Individuals and corporations are both eligible to make the election. Remember that you have to itemize deductions in order to get a tax benefit from charitable contributions. If you claim the standard deduction, you won't receive a tax benefit. Higher income taxpayers have part of their itemized deductions phased out for 2009, but not for 2010. They might receive a bigger tax benefit by not making the election and deducting the donation on their 2010 income tax return. No double dipping! The donation may only be deducted on an income tax return for 2009 or 2010, not both! Since the election is only available for donations up to February 28, 2010, there is less than a month left before this tax benefit expires. California businesses that reported more than $100,000 in gross receipts from a business or rental property on their 2007 federal income tax returns and that don't file sales tax returns will be required to electronically file a California use tax return for 2009. The California State Board of Equalization is mailing notices in early March, 2010. The use tax returns and tax payments are due April 15, 2010. A use tax return must be filed even if there is no tax due. February 17, David Beck, CFP, "Applying for financial aid for higher education"
February 24, David Beck, CFP "Using tax benefits and student loans to pay college costs"
March 3, attorney Ray Sheffield, "Estate planning for retirement benefits"
March 10, John Herzog of Valley Community Bank, "Small business financing"
Financial Insider Weekly is also broadcast Friday at 4 p.m. on cable channel 15 in Cupertino, Los Altos and Mountain View. Starting this week, it will also be broadcast Thursdays at 7 p.m. on cable channel 26 and AT&T U-verse channel 99 in Marin County. Marketing guru Dan Kennedy, who is a mentor of mine, has written two new books that are now available in book stores and online. They are No BS Sales Success in the New Economy and No BS Business Success in the New Economy. Dan writes excellent material and these books are a bargain to "catch" some of his business savvy for only $15.95 retail per book. Can you claim a tax deduction for monetary donations to a family member or friend? How much can you claim for items donated to the Goodwill? How do you determine the values? Donations to a family member or friend are not tax deductible. Only donations to a qualified charity are deductible as charitable contributions. Items donated to Goodwill and other charities are based on the fair market value of the items. There are no published guidelines that I'm aware of from the IRS. Here is one from Goodwill Industries of San Diego: http://www.sdgoodwill.org/donation_values.shtml. If you give more than $500 of a given type of merchandise (used clothing), special disclosure is required on IRS Form 8283, which is required to be included with your income tax return.